Since last several months, I have taken it up on myself, to do weekly groceries every Sunday morning. It is not that I have suddenly developed a burst of enthusiasm for doing this routine chore, week after week. My wife was slightly unwell then, and I was rather forced to do this on that particular week. Somehow I seem to have been stuck with the job at least for present. I go to a grocery store near my house, which stocks besides the groceries, fresh vegetable too. This way, I can get rid of all weekly shopping within a span of an hour or so, with no botheration for rest of the week. This Sunday, as I was deeply engrossed in the shopping activity, I suddenly happen to notice, that in the store, there were many single men like me doing the groceries. Surprisingly, they seem to be of all the age groups. Obviously there were lot of seniors like me, but there were also young men going around. The only difference between senior shoppers and young shoppers appeared to be that the young shoppers kept on talking to their wives at home taking guidance regarding purchases. So has the doing groceries become a thing for guys? My experience at least suggests so. But is it only specific to India or the trend is international? An article published recently in WSJ says that in US, men are responsible for at least half of the grocery shopping and meal preparation for their households. Now, that is a very large percentage and should make a large impression on customer preferences. 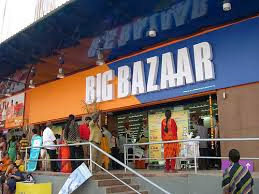 I do not know the exact percentage of male shoppers here in India, but it is likely to be large. 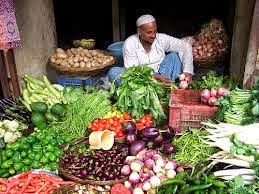 It comes to my mind that grocery or vegetable shopping by men is really not all that new in India. 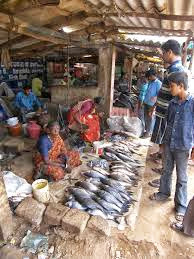 Buying lamb meat or fish was strictly a male preserve though the fish sellers at least in coastal places like Mumbai, would mostly be women as men would be busy fishing on the seas. In yesteryear, womenfolk of India rarely ventured out of their homes and all shopping was essentially an activity of men. In our home though, my mother worked in a school and did not stay home. Still, I remember my father, going on his motor cycle to vegetable market on every Sunday morning with two huge canvas bags hanging from both sides of the motor cycle handle, during his active days. He always returned with bags full of vegetables. So my doing groceries on Sundays, is nothing revolutionary after all. Recently I came across an article that said that whitening creams specially for men are becoming very popular in India. So similarly, if more and more men are seen in grocery stores are there special products available, which would suit more to a man's taste? But what are man's tastes and what do men buyers men like? The WSJ article I mentioned above gives some interesting insights and describes the way US manufacturers are adopting their products to suit a man's taste. I have yet to see any special grocery products for men here in India, except for cosmetics. There are special perfumes for men and some exclusive for men products like hair creams, shaving creams and after shave lotions. But other cosmetic products like tooth pastes still remain family oriented. 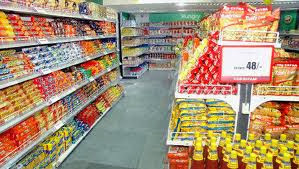 Male shoppers probably are not attracted to a product described by terms such as, low calorie or low fat ,but would rather go for products with high proteins. In cafes like Starbucks, I have never seen men drinking frozen yogurts. Similarly men always seem to like terms like strong brew or Greek taste. Since Indian grocery stores do not offer any special items for men buyers, it is difficult to talk about their preferences. I have however seen subtle changes in the merchandise available for sale. More varieties of foods like Olive oils, cheeses, bread spreads or large, 1 litre or 2 litre soda bottles are commonly seen. The varieties of ready to eat foods also also growing very fast. Many men, who stay single, prefer to buy these. I feel that it is just a matter of time, before Indian manufacturers would realise the change in consumer base and would come out with products specially designed for male buyers, like their counterparts in US have already done. Till that day however, men would have to keep buying stuff designed and made for families and women.